Jordy Mongoy’s hat-trick fired Hastings United Football Club to a convincing victory in a second versus fifth encounter this afternoon (Saturday). The young forward netted once in the first half and twice in the second period as Hastings achieved an impressive 3-0 win at home to Whyteleafe in the Bostik League South East Division. It was Hastings’ first success against Whyteleafe this season following two defeats back in the autumn and it was achieved despite losing two players to injury during the first half. Hastings manager Chris Agutter made three changes to his starting line-up from the previous weekend’s 3-3 draw at Phoenix Sports. Adam Lovatt, Lanre Azeez and Hassan Ibrahiym came in for Sam Adams, Jamie Fielding and Tom Climpson. Agutter was forced into an early alteration, though, as defender Jack Tucker hobbled off in the 12th minute and was replaced by Climpson. Just a minute later, Climpson laid on the opening goal. His lovely touch just outside the Whyteleafe penalty area put Mongoy in on goal and he stroked a neat finish between away goalkeeper Tyler McCarthy and his near post. A minute after that Hastings goalkeeper Charlie Horlock made what turned out to be his only noteworthy save of the afternoon, diving to his left to push aside Matthew O’Donoghue’s shot from 20 yards. There was little goalmouth incident during the rest of the first half, although Andre McCollin did get into a decent position on the break for Whyteleafe only to be let down by a poor touch. Several refereeing decisions went against Hastings, but they looked pretty comfortable on the whole as Whyteleafe opted to sit off and allow the home side to have possession at the back. Ibrahiym, starting a game for the first time since November 24 having been injured in the run-up to Christmas, lasted just 39 minutes before hobbling off and being replaced by Adams. Hastings took a firm grip on the contest with a superb second goal in the 54th minute. Cruttwell played a splendid diagonal ball out to Azeez on the right touchline and he chested it down before beating his man and delivering an inch-perfect cross for Mongoy to power a header into the roof of the net. 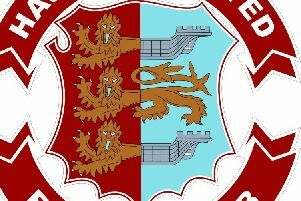 It was all very comfortable for Hastings thereafter as Whyteleafe, who won 4-2 at The Pilot Field in a Buildbase FA Trophy tie during October, never looked like getting back into the match. Mongoy wasn’t far away from getting on the end of a terrific ball across goal by Adams, who seconds earlier spurned a very good opportunity as Hastings outnumbered Whyteleafe on the counter-attack when his attempted pass to Ajakaiye was cut out. Mongoy had a well-struck angled drive pushed round the post by McCarthy before Ajakaiye’s chip over the goalkeeper dropped just wide of the post, to the surprise of many in the main stand who thought it was in. Mongoy completed his treble in the 82nd minute. Jack Dixon’s cross from the side of the penalty area on Hastings’ left was missed by the head of Ajakaiye, but Mongoy prodded home from six yards. It was a job very well done by Hastings, whose hard work off the ball was a real feature of their performance and key to their fourth clean sheet in five matches. Hastings: Horlock; Howlett-Mundle, Cruttwell, Tucker (Climpson 12); Azeez, Ibrahiym (Adams 40), Lovatt, Dixon, Black; Ajakaiye, Mongoy (Bamba 85). Subs not used: Walker, Fielding. Attendance: 440.